The Koper's Trail is located in the Rifle Mountain Park about 15 miles north of Rifle, Colorado. The city of Rifle created the park in 1921. The city was taking advantage of a law that allowed them to acquire land near their municipalities to create and preserve park land. The mountain park has been well known by the residents of Garfield County for decades as a nearby place to escape the heat and enjoy a relaxing day. In recent years it has become just as popular with rock climbers that come to scale the cliffs of the canyon. The southern most trailhead for the Koper's Trail can be found just before the spot where the road first crosses Rifle Creek. 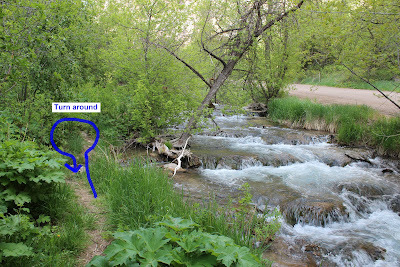 The main parking area is across the creek and there are also a few spots near a picnic area before the crossing. The trail is well worn and easy to follow but there are a few places that are a little harder to negotiate. The trail is sandwiched between the canyon wall and Rifle Creek. It makes for a very peaceful environment that is disturbed only by the occasional vehicle on the road. People are often surprised when they visit the ice cave in the middle of the summer and see that there is indeed still ice in it. A little known fact about caves is that the temperature inside of the cave is equal to the average temperature over the course of the year outside the cave. This canyon is narrow with high cliffs and sees only a few hours of direct sunlight each day making the average temperature quite low. There is a seep that rains down on the cave from above that keeps the cave moist so it has something to make the ice from. It also makes the ice very slick if you try to walk on it. There is a trail sign pointing to the Upper Ice Cave on the other side of this cave. The upper cave is less than a half mile up stream. Rock climbers have left quite a few permanent anchors on the cliffs. There are over 250 bolted routes in the canyon. The trail up ahead was clogged with a group of rock climbers so this ended up being the turn around point. We drove up to the other end of the trail and there was a large group of rock climbers there also so we will have to return another time to get pictures of the upper ice cave and to re-hike the whole trail. There are numerous wildflowers like this Fendler's waterleaf. Rifle Creek also has a lot of poison ivy in places so be sure to especially watch out for that. The Rifle Mountain Park has numerous picnic areas from which to choose. The gravel road is well oiled to keep down the dust. Rainbow trout up to 20" long have been taken from East Rifle Creek so you might consider doing a little fishing in the area. At times you can spot a big one lurking under an overhang in the bank. While in the area you might also consider visiting the fish hatchery and Rifle Falls. If you would like to see it for yourself then all you have to do is 'Take a hike'.